With the news of Facebook deciding to make their newsfeed feature more content from friends and family and less content from businesses, Facebook ads are more important now than ever before. Whether you’re a brand new startup or a business that’s looking to grow, Facebook ads is one of the best methods to scale up your company. They were one of the best methods before and they still are now, unless their prices get exorbitant. Facebook ads are the best way to drive a lot of traffic in the shortest amount of time. 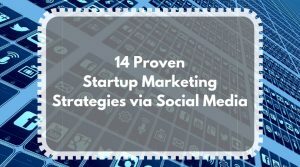 So in this post, you’re going to see how to run a successful Facebook ads campaign for your small business or startup. Usually, a brand new user of Facebook Ads will use the simplest types of ads so they can get the hang of running ads through Facebook and learn how the interface works. Figure out what type of ad you want to use. Below are the five different types of ads. Create up to 6 ads with one image each at no extra charge. Create an ad with 2 or more scrollable images or videos. Displays up to 10 images rotated by arrows to the left and right of the frame. Create a looping video ad with up to 10 images. Canvas allows you to add a fullscreen landing page that opens instantly when someone interacts with your ad on a mobile device. Use Canvas to feature images, videos, products and call-to-action buttons that link to your app or website. If you’d like specific information on each one of these types of ads, then visit this WordStream article and you’ll get the specs for each one of them. Without a goal for your Facebook ad, you are just wasting money. That being said, it’s incredibly important for you to figure out what the goal for your ad is, and then create an objective. Below, you can see the first screen for creating an ads which is the interface to choose your marketing objective for your campaign. Regardless of what type of campaign you pursue, the initial goal should be for you to find a high converting / high performing ad from your A/B tests using a small budget. Once you find an ad with a high click-through rate (as close to 3% and 5% should be the goal), then you put more money into the ads. Start with a small budget of $40 to $50. 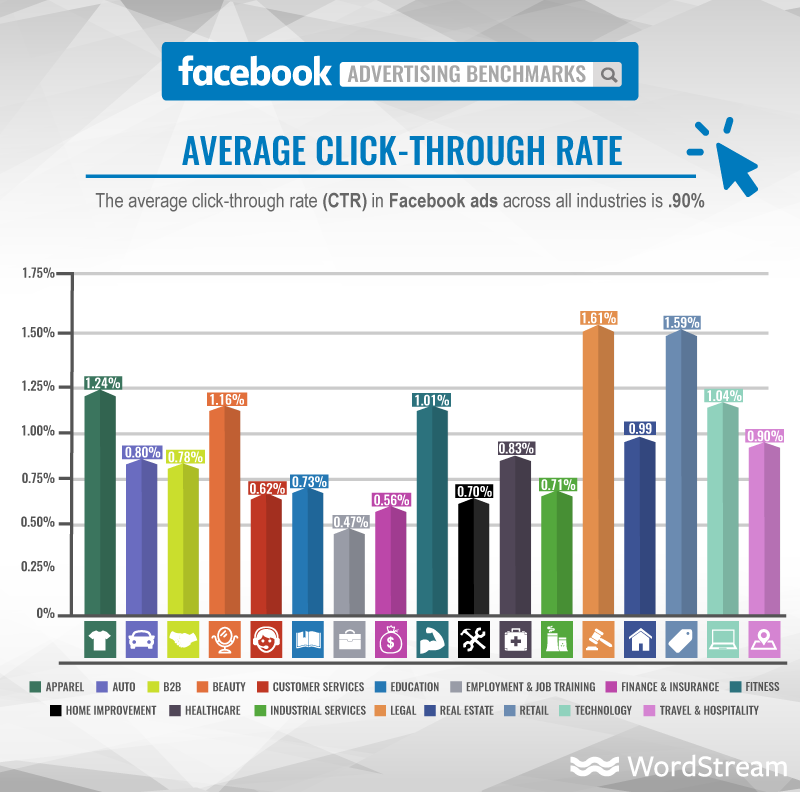 According to Wordstream, the average click-through rate across all industries is .90%. 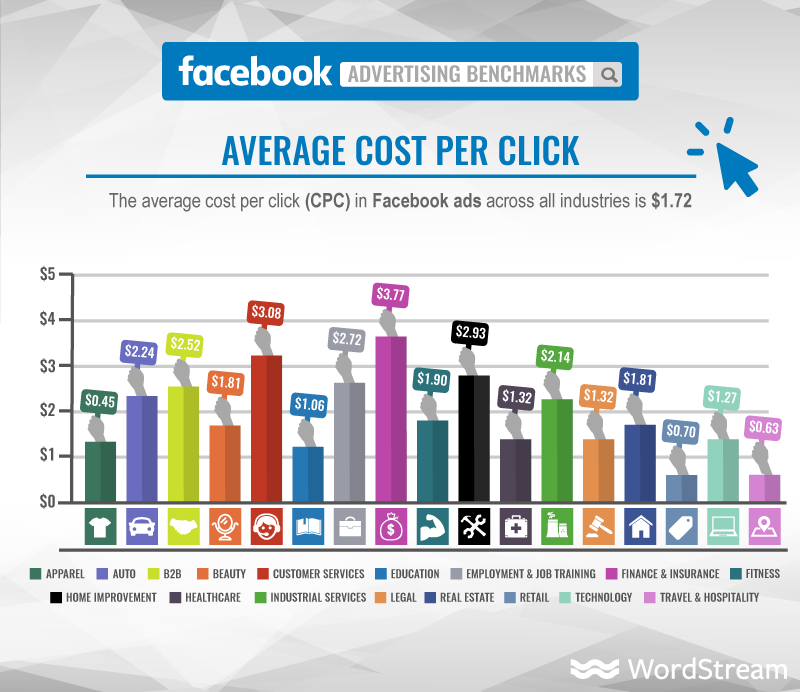 Moreover, the average cost per click with Facebook ads across all industries is $1.72. Make sure you are aware of your industry cost per click so you can price out your ad-spend strategy. Below, you’ll see the chart showing you the CPC across all industries. Of those people who click on your ad, the conversion rate of visitors becoming an email subscriber is usually somewhat high because they’re interested in your product or service. Typically a 5% to 10% conversion rate or higher will occur. Shoot for the stars, though! You might even want to direct them from the ad to a specific landing page with a highly relevant incentivized lead magnet. Always have two versions of your ad so you can A/B test them. Even if Facebook doesn’t allow it for the targeting options you select, you can still run one ad until your ad-spend runs out and then run the next one right afterwards. Then, you can at least compare results. Or, you can run both ads at the same time and test that way. 1) Make sure you only change one thing in your variation for the “B” ad. 2) After a few hundred impressions for each ad, choose the best performing version with the highest CTR and create another variation, varying from the best perfoming ad. 3) Record your data in a spreadsheet including the copy you used for each ad. Using a Facebook pixel tracker is essential to getting to know your site visitors behavior better and marketing to them. The number of pixel fires you see is a measure of all the activity on your website, not just the activity driven by Facebook ads. It can provide deep insight into your visitors’ behavior and maybe give you the edge you need to better serve your target customers. Well, you can use the data that the pixel collects to remarket to those same exact people on Facebook instead of doing a lookalike audience. If you haven’t created one yet, then start now! In the image below, you’ll see where to find it in your menu. When you create a Facebook pixel in your Facebook account and set it up on your website, it will not be optimized. You can optimize your pixel by checking out the guidelines and guides by Facebook for doing so. It requires adding more code to the tracking code on your website. 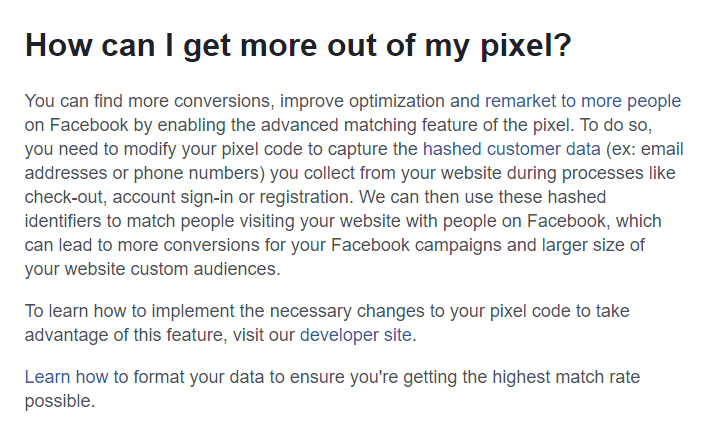 In addition, this clickable linked image below tells you how you can get more out of your Facebook pixel, bringing you to the page that corresponds with that section. Pretty cool stuff – right? 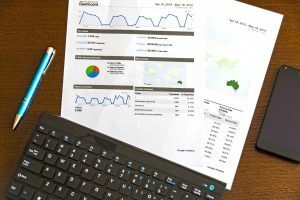 What’s more, you can find out how to measure your website conversions here. 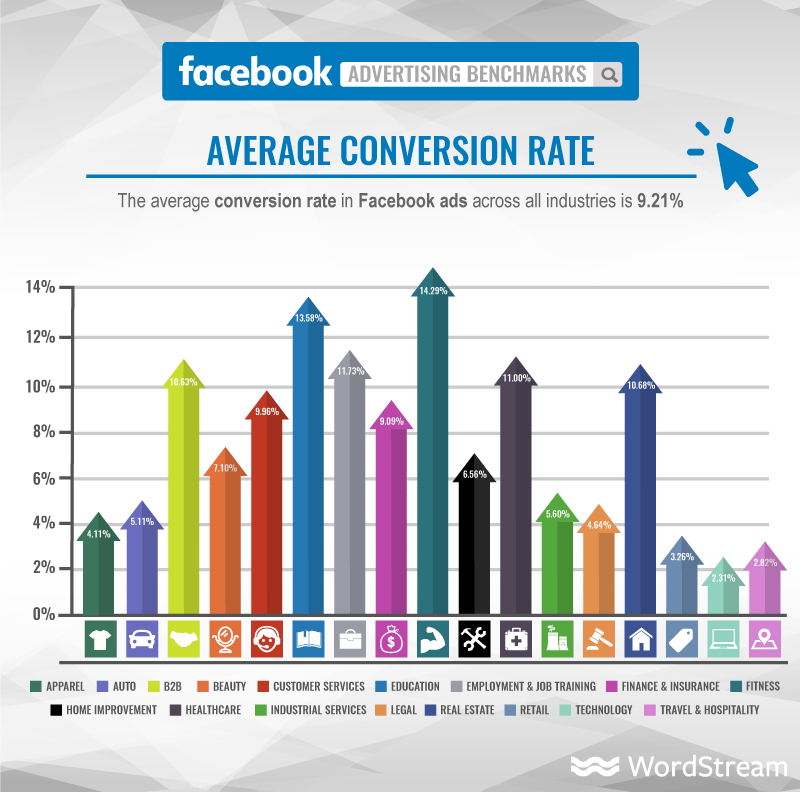 Identify your audience for Facebook Ads. 1) First thing’s first: Understand your target audience for your product or service. 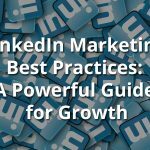 If you don’t already have a customer profile, then you should definitely make one before you proceed. Who are your most likely users? 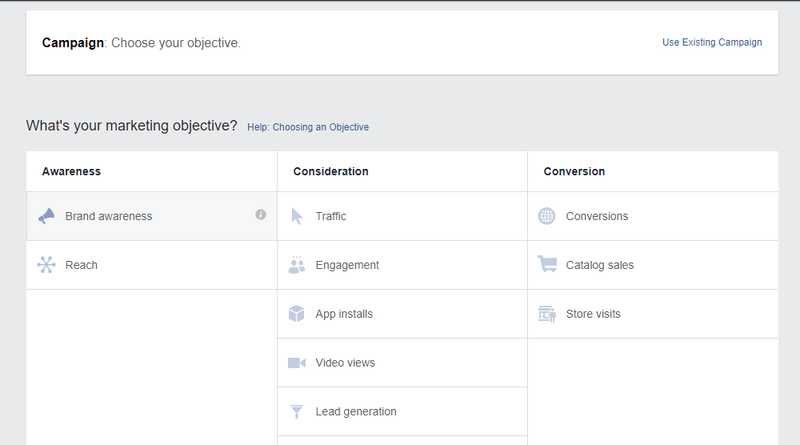 2) Find out what Facebook pages they’d be interested in by looking up your direct competitors and write them down. The people who liked those pages can be targeted via Facebook Ads. 3) Decide if you want to choose “Brand Awareness” or “Reach” when starting your campaign. Brand awareness allows you to “reach people more likely to pay attention to your ads and increase awareness for your brand.” You cannot A/B test with this ad-type. Reach allows you to “show your ad to the maximum number of people” You can A/B test with this ad-type. In addition, use audiences that engaged with your content from previous ads, if any. 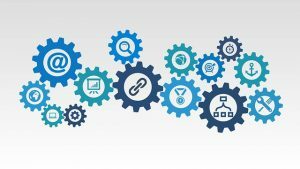 You can create ad sequences based on the specific people that saw and clicked on a specific ad leading to a particular landing page on your website. These ad sequences can get you more sales and pay off very well for you. As mentioned earlier, it’s important for you to test your ads out before you spend all of your Facebook ads budget. Why blow tons of money on a new ad when you don’t know how it will perform? Start with $40 to $50 to test it and reserve the rest of your ad budget for when your tests are concluded. You can set your ads up by paying a fixed amount per day or you can let it run until there’s no money left. In addition, you can choose whether you want to pay by impression or by click. However, for your first advertisement, you have to spend at least $10 USD getting charged for impressions before you can switch to paying per click. 1) Go to your Facebook Ads Manager. 3) Select Facebook Power Editor and turn off your browser’s ad blocker if you don’t go immediately into the power editor. 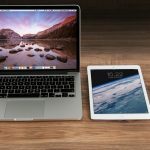 The power editor will let you run up to 5,000 ad campaigns at a time, but it’s very likely that you’ll never need to create that many simultaneous campaigns. 4) Create a campaign for your objective/goal. Here, you can change your goal, your campaign name, and the buying type. 5) Determine how many ad sets you’ll have and create them. Here, you can set and change the audience, budget, and ad placements. You can have more than one ad set. 6) Under each ad set, you then create your ads. Here, you can alter the ads themselves with the copy, image, link, and display type. You should have at least two ads per ad set for A/B testing. 7) After you create your ad, go back into your power editor dashboard so you can schedule the days your ads are active as well as the time frames they’re active for. Otherwise, Facebook will run your ad budget dry by keeping it going throughout the entire day(s) it’s scheduled for. 9) Once you get in, select the option to “Set custom schedule” under “Frequency” so you can change your schedule. 10) Now is the time when you literally schedule your ad(s) as you can see in the image below. Ideally, you should schedule your ads for the time of day when there are the most people online from your target audience for maximum efficiency of your budget and Facebook ads. Congratulations. 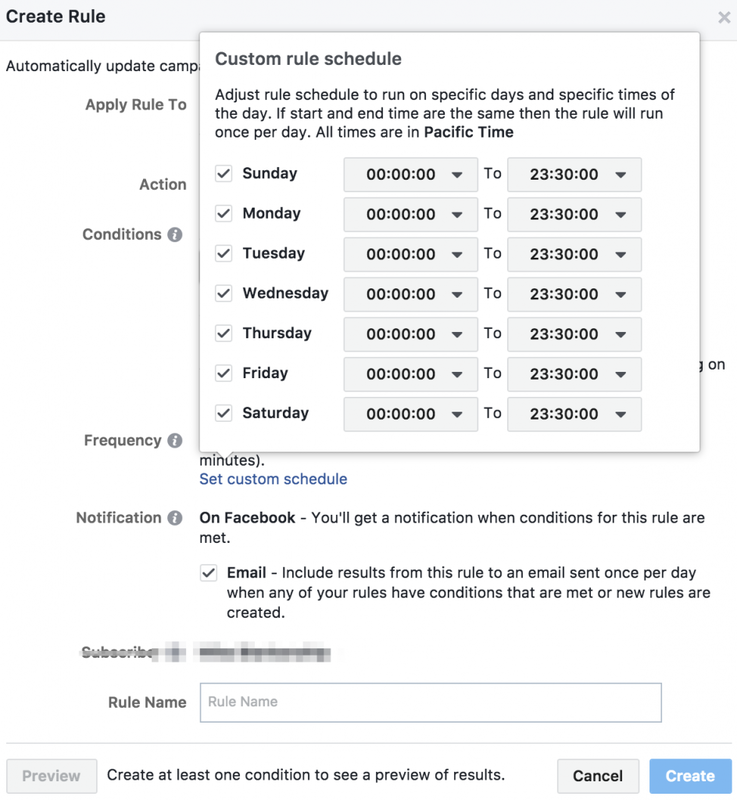 Now you’ve successfully scheduled your Facebook ad! There are three types of audiences: Custom, Lookalike, and Saved audiences. You can find them by clicking on “All Tools” within the Facebook Ads Manager and then you navigate to Assets. Under Assets, you’ll find Audiences. Click that and you’ll be where you need to be. Custom audiences allows you to pick from five (5) different options: Customer File, Website Traffic, App Activity, Offline Activity, and Engagement. 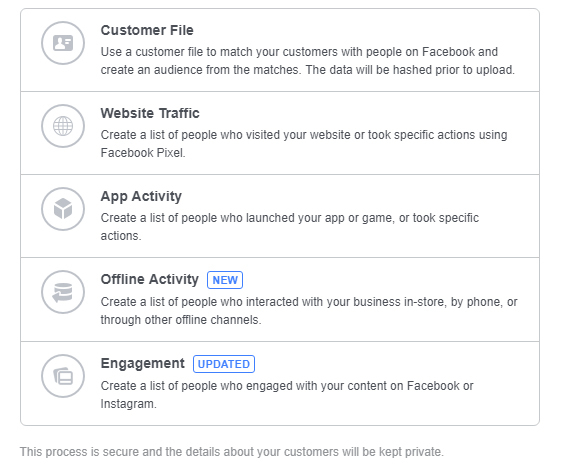 One custom audience in particular that’s great is “Customer File.” You can create custom audiences based off of your startup’s email list by actually loading a copy of your list into the Power Editor and you can market to them on Facebook. The great thing about using customer files is that these are people who are already interested in your product or service and what you have to say. When you have a Facebook Pixel installed on your website, you can re-target your website visitors. This method is called remarketing. 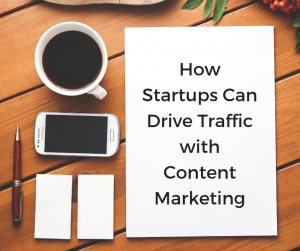 Website traffic audiences are a great way to get more email conversions by offering something great, like a webinar, to provide additional value to them and get them in your funnel. App activity is an excellent way to remarket to your users, just like for website traffic. Remember, you only want to make these ads for people who are already familiar with your app. Offline activity is meant to be used for ads when you’re purposely tracking offline activity, like purchases in a physical store. It requires some technical Facebook API setup, data collection, and uploading that data into Facebook so you can make more informed decisions when setting up your Facebook ads. Engagement is based off of people who’ve engaged with your content from Facebook or Instagram. Interactions from people who have interacted with your Events on Facebook. In addition, you can create a lookalike audience. A lookalike audience is based off of data collected and the people who currently like your Facebook page. Facebook then looks at all of the demographics and interests of those people and markets your ads to people with the same characteristics and interests. Lastly, a saved audience is based off of one or more previously targeted audiences. As the infographic above mentioned, you want to keep your ads engaging. You want to catch your audience’s attention, capture their interest enough to click on your ad, drive up their desire in a way that might make them mentally salivate, and get them to take action with a strong call to action. Similarly, you may not have text, but you have a video. Despite the difference, your delivery should still be the same. Facebook now has over 2 billion monthly active users out of 7.6 billion people in the world (as of 1/26/18). That’s 26% of the world using Facebook, making it one of the best advertising platforms in the world, standing beside Google. If you’re a business and you’re not advertising on Facebook, then the chances are high that you’re leaving money on the table. Facebook ads can breathe new life into your company or take your startup from being unknown to an industry leader. If it’s not working for you on your first try, then you need to try a different approach. Don’t get discouraged. Work at it and keep testing – you’ll probably get it right with a little extra work! Have you found any great tricks or tips for creating Facebook ads?